Student Union Renovations are Underway! The UMass Student Union is undergoing a major renovation that will be finished in fall, 2020. 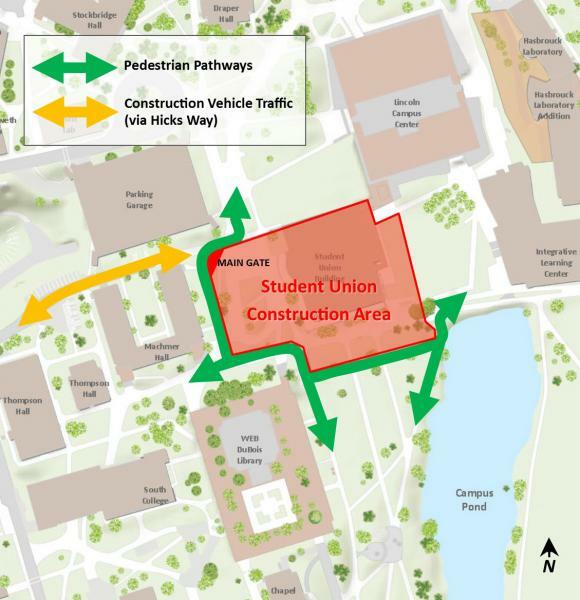 During construction, pedestrian routes have changed and Student Union offices have moved. Get updates (and see what the finished building will look like!) on the project page. eCampus.com is UMass Amherst's new virtual bookstore for textbooks and other course materials. Sell back your used textbooks, or buy books for spring. Learn how to order from eCampus @ UMass via SPIRE. Student Care Supply Closets provide free toiletries and household items to students facing economic insecurity and/or an unexpected financial emergency. Find out how to donate or receive supplies. The Center for Counseling and Psychological Health (CCPH) now offers Therapist Assisted Online (TAO) a seven-week, interactive, web-based program as well as TAO Self-Help, a customizable, self-guided course. UMatter at UMass is an initiative intended to affirm the UMass values of care, compassion and active engagement. A comprehensive look at what UMass has to offer when school's not in session.